I was an overachiever in my first three years of college, and my reward was the opportunity to fill my fourth year with whatever my heart desired. This turned out to be figure drawing. The creativity that emerged from that year was pure magic–but not at first. Despite being deeply immersed in the arts from the time I was four, I didn’t have any skills when it came to drawing the human form. For the first time in my college career, I seriously struggled. Week after week, I stayed up all night trying to get it right. And week after week, my professor gave my work the same rigidly polite smile and the dreaded “hmmm” before moving on to the next student’s work. For the first half of the semester, I ached to be better at it. I lost sleep over it. Then it happened–I just threw it all to the wind. No matter how hard I worked, she never liked my art. No matter how hard I tried, I never liked it. The fact was, I didn’t need the class. I was there to play–so play I would. Then I remember dumping out the entire bucket of paints I had all over the kitchen floor and just making the decision to stop trying. Truthfully, I didn’t care if it looked like anything. It didn’t matter if it was good. I just wanted to experiment, fearlessly and without expectation. This shift of mindset, from expected result to the delightful absence of any expectations whatsoever, opened something in me. This is when all the magic happens. For me, it took twenty years to learn the value of open-ended creativity. It won’t be that way for my daughters. 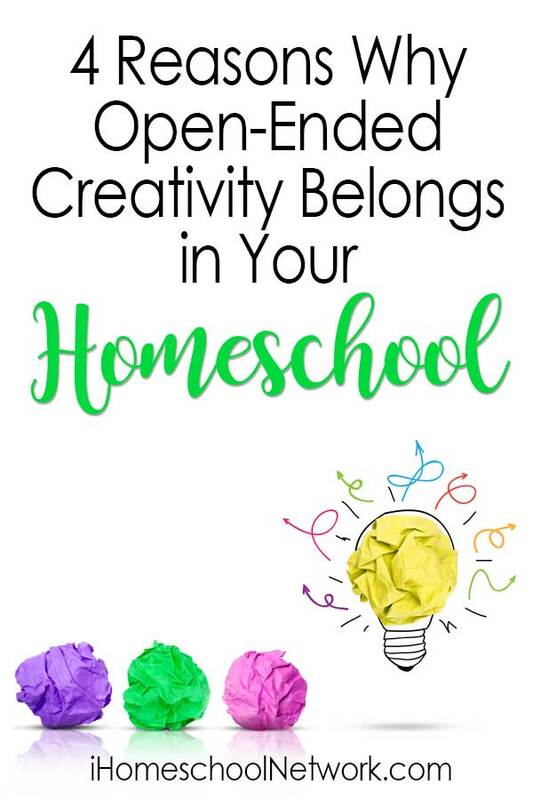 When my husband and I made the decision to homeschool, it had a lot to do with providing opportunities for open-ended creativity in their education. When we learn about the great minds that have shaped our world in science, art, innovation, and technology, we see that their early experiments were filled with mistakes and mishaps and messy failures before things clicked and they changed the course of the future. That is what open-ended creativity does. It gives permission to get it wrong before you nail it, before you even know what it is. But that’s not the only benefit of providing those opportunities for our children. We often forget as adults that childhood is positively filled with constant effort to hit the next milestone. It’s time to learn to walk, it’s time to learn to read, it’s time to learn long division, it’s time to learn to control our emotions and write neatly and spell correctly. These years are overflowing with meeting the expectations set before us–and that’s a good thing. We (hopefully) embrace the challenge and rise to our potential. But meeting the expectations that others have for us is not really what this human journey is about, is it? Writing a perfect essay is not our purpose, but the secret sauce that only we can add to that essay might be. Learning about the scientific method is not our purpose, but the wild idea we get one day while executing it might be. Drawing an anatomically correct person with a stick of charcoal is not our purpose, but breathing our life into it with our own unique vision might be. 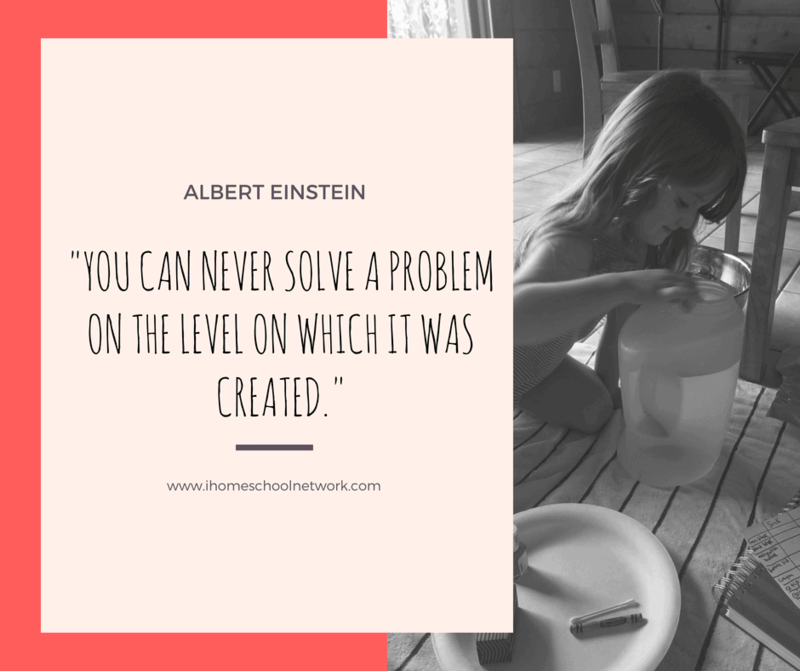 If we don’t give our children the opportunity to play in their own thoughts, their own voice, without a directive about what the outcome needs to be, they will never know the purpose of the vessel that practice and diligence builds. It’s not hard to see that things in our world are off-kilter these days–all you have to do is turn on the news. People are angry, they’re tired, they don’t feel heard, they hurt. We might be doing a fantastic job raising people who know how to sit in a chair for eight hours and follow directions, but we are really missing the mark when it comes to teaching people how to deal with big emotions. Open-ended creativity is the gift we give ourselves when we need consolation. Everyone needs a safe space to throw down the pieces of themselves that aren’t acceptably displayed in polite society. We need to be able to write down the thoughts that keep us up at night, to scribble, to tinker. Sometimes this manifests as something complex and beautiful, and sometimes it’s drawing concentric circles in the dirt with a stick. We were given this gift–the desire to scribble or sing or ramble or manipulate things around us when we’re grappling with something bigger than ourselves–from the very first days of mankind. But lately it seems that we’ve decided that those things don’t have real value because they’re not productive. The result is a society filled with people who don’t know how to self-heal. We just take more medication or find other ways to numb our pain. It’s mind-boggling to think how many great discoveries in our history seemed to happen by accident. The discovery of penicillin, the invention of plastic and velcro, the creation of the first x-ray machine, these were all the result of an open mind that was paying attention when something unexpected happened. People who have been given the chance to play and experiment tend to notice when something really neat happens by accident, and to take action when it does. We owe many life-saving and convenient inventions to people who spent a great deal of time simply experimenting. These discoveries have literally steered the course of history. 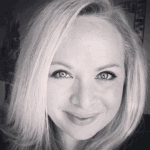 Listen, being a homeschooling parent isn’t exactly a cakewalk. We spend a lot of time comparing curricula and lining up goals. There are materials to gather, lessons to plan, worries to worry. Are we doing enough? We understand and respect the tremendous responsibility we’ve taken on. We work hard at it. The beautiful thing about providing opportunities for open-ended creativity is that it’s so easy. Provide age-appropriate materials: paint, paper, old newspapers, paper towel tubes, crayons, glue, etc. Respect the private nature of open-ended creativity. Resist the temptation to ask them to explain. Let them decide when and if they want to. Give them space and encourage mistakes–that’s how we make discoveries. 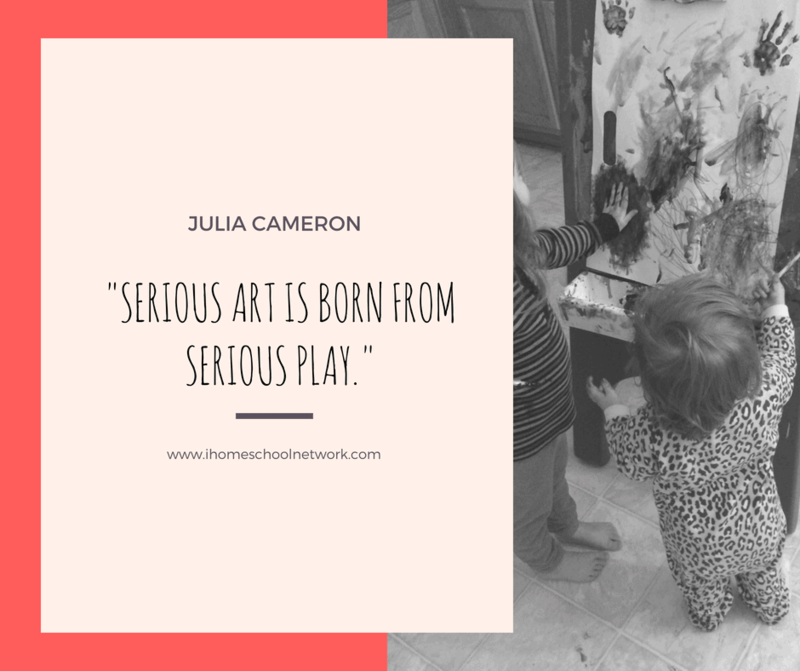 In The Artist’s Way, Julia Cameron writes that, “Serious art is born from serious play.” Art is in everything we do as homeschoolers–the art of great literature or great leadership, scientific discovery, the language of math. We give our children the best brushes we have–the books and the ideas and the formulas. If we can then give them the chance to play with these brushes without fear or expectation, they will do great things with them.